Let’s be real. Cleaning up is the absolute worst part of cooking. 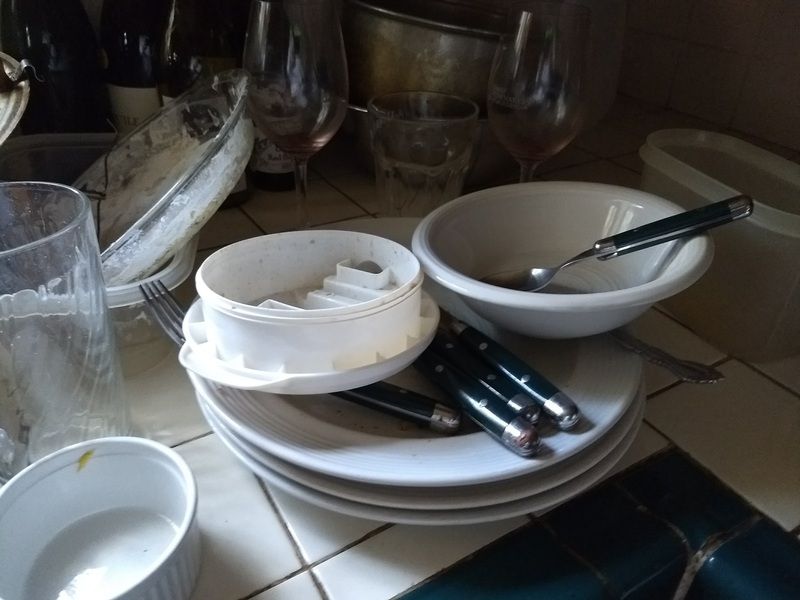 And after a full-on holiday feast, the last thing you want to do is haul yourself up and wash a larger than normal pile of dishes, not to mention the icky, greasy pans. The funny thing is, with all the holiday help tips out there, no one, but no one offers tips on how to clean up your kitchen after a big holiday meal or party. I suspect it’s because it is such a dreary chore that there really isn’t much that can be done to make it less so. But there are a few things you can do to make a little easier. First, don’t make such a big mess in the first place. You can read my post here on how to do that. But the important part to remember is that if you don’t absolutely need that dish or pan, don’t use it! Clean as you go, too. If you’re waiting for the potatoes to boil, you can clean up the peelers and other dishes. There will be less to do later. Make sure to de-glaze the roasting pan. That’s usually going to be your greasiest and ickiest. De-glazing is easy. You get the drippings and grease boiling, then add some broth, wine or other liquid, get it boiling again and as it does, you scrape all the stuck-on bits into the liquid and use it as a base for your gravy. If you’re not going to make gravy or some other sauce, either pour all that goo into a container and save it to make a sauce later, or feed it to the dog. Or, if you’re not going to make a gravy, squirt some dish soap into the pan and use that to boil and scrape everything up. If someone else offers to help, accept. Now, I get that there are times when this isn’t feasible. But even if that surly relative is only asking to be polite, accept the help. Women have used clean up time for millennia as a chance to gossip about the rest of the relatives. You can, too. Sometimes listening to a good comedy podcast or other show helps ease things a little. Sometimes the noise is just annoying. Get all the plates scraped off as you stack them on the counter. Make sure any paper towels or other wrappers are in the trash, and any containers that you’re going to recycle are ready to be rinsed. When you’re packing the leftovers, be sure you have the lid next to the container. I can’t tell you how many containers I’ve had to wash because I dumped the leftovers in, then couldn’t find a lid to fit. Wipe down any counter or workspace that will serve as a landing area for clean dishes. You don’t want to go to all the trouble of washing something then have it pick up crumbs or globs of sauce dribbles. I like using a large towel over our worktable rather than the dish rack, which is always too small. Wash the least dirty to the most dirty. In other words, if you wash your glassware first, it won’t pick up grease from the wash water and your suds will last longer. Nor will it pick up the tiny bits that were left on any plates and pans. Get everything loaded into the dishwasher that can go into it and don’t worry if you miss a fork or two. Those are easy to hand wash.
Let as many dishes air dry as you have room for. Your good glassware will probably need to be dried right away or it might get spots, and there may not be a lot of room in your kitchen to leave pans out. But whatever you can leave out, you may as well. A nice glass of wine can help or it can increase the odds of something breaking. Finally, once you get the plates scraped and the leftovers put away, you can come back to most of it in the morning. If any of your pans are crusted with something starchy, you may want to soak those in some cold water overnight. Greasy pans should get the soap treatment (see above) while they’re still hot. But unless you’re going to risk your drains by pouring the soapy grease down right away, along with lots of hot water, you’ll probably be better off wiping up the mess with some paper towels once they’re cold, and then washing them. Hope this helps. And please, feel free to share any cleaning up tips you have. We could all use the help. Lol about the nice glass of wine. I’m sure it would help! I’m all for these tips. The best one, though, is not to make such a big mess in the first place. A glass of wine helps just about everything! Thanks for the comment.